Andrew: None of them are wearing their scarves though. You’re ok. Just go in. me: Ohhh so just because all of the other naive tourists are doing it, so should I? NO! I’m not going to be disrespectful! Andrew: So… you want to buy a scarf? Andrew was resigned to the fact that he couldn’t go inside in his shorts. They weren’t exactly selling men’s shorts around the hippodrome like they were selling women’s scarves… So I got a scarf, and we went back. It was still closed. me: Well, now what are we going to do?! 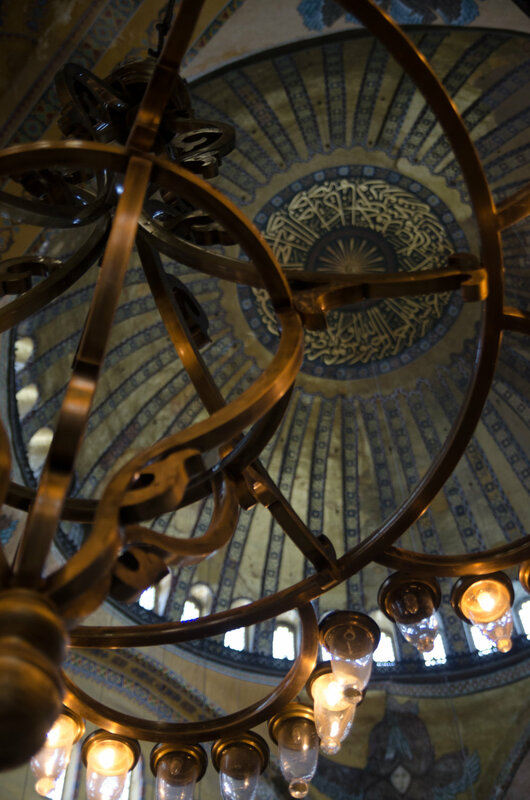 Sultanahmet is the Old City of Istanbul. Fun fact: it’s the area that was specifically known as Constantinople. Most of the ancient sites (churches, mosques, the palace) are here. There is a LOT to do. 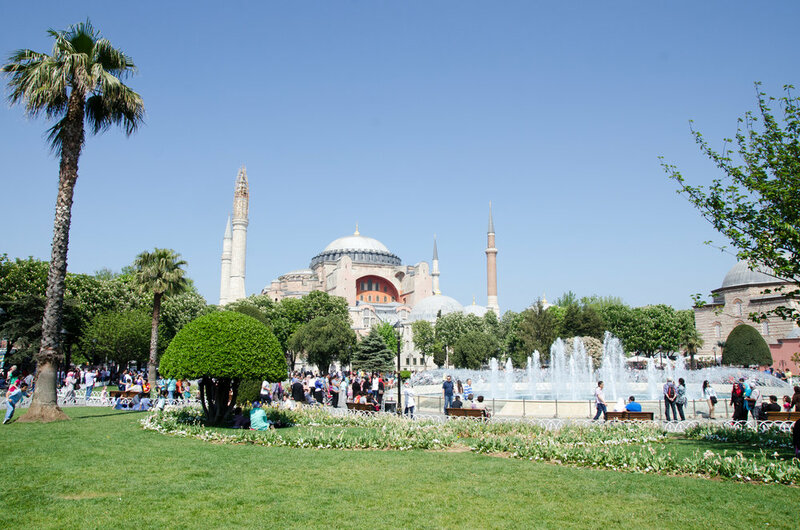 We had started at the hippodrome just outside of the Blue Mosque and after going back and forth (the scarf debacle) we just had to weave our way around large groups of tourists to get to the Ayasofya (Turkish for the Hagia Sophia) across a couple of lawns and squares. 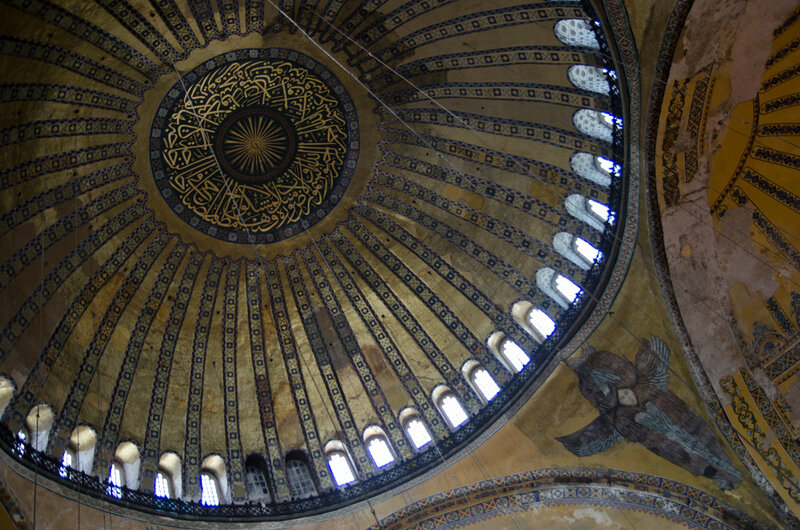 The Ayasofya (not to be confused with something like “The Eye of London” which is exactly what I did. 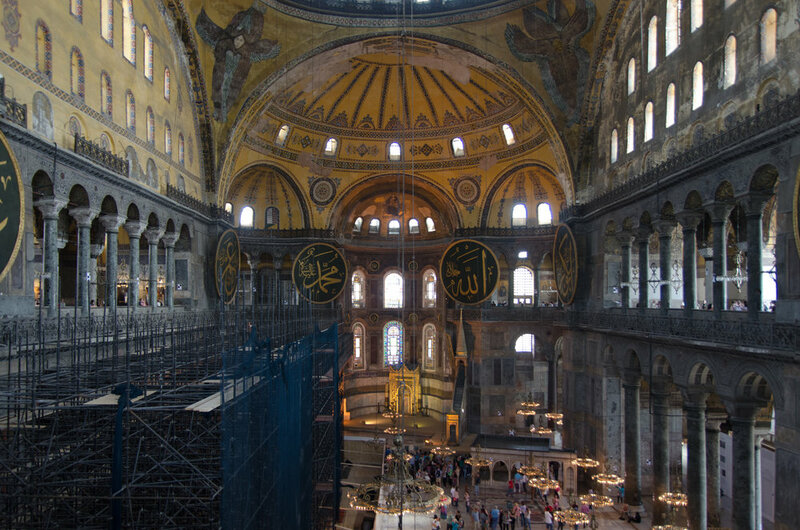 I knew of the title Hagia Sophia, but not the Turkish Ayasofya, and was rather confused when Juliet and Andrew were talking about it prior to our visit) anyway. 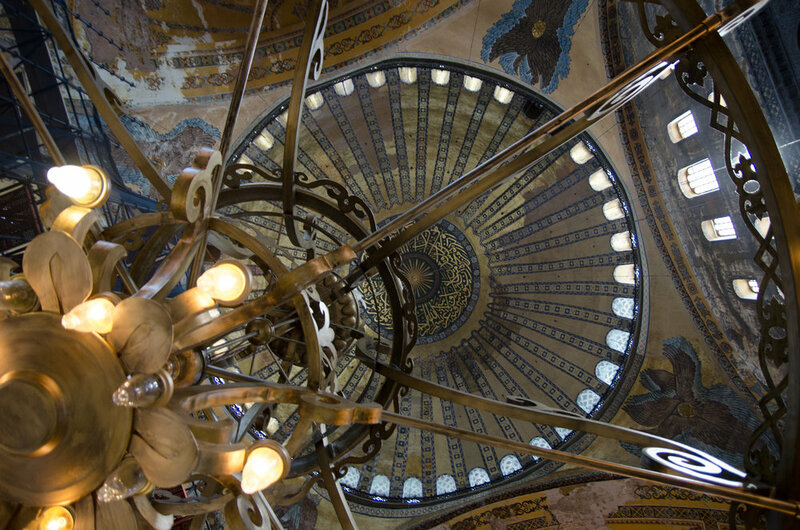 The Ayasofya is a rather complicated building. It began as an Eastern Orthodox cathedral (and seat of the Patriarchate of Constantinople) from 360 to 1204. from 1204 to 1261 it was a Roman Catholic cathedral. Then it went back to being Eastern Orthodox until 1453. 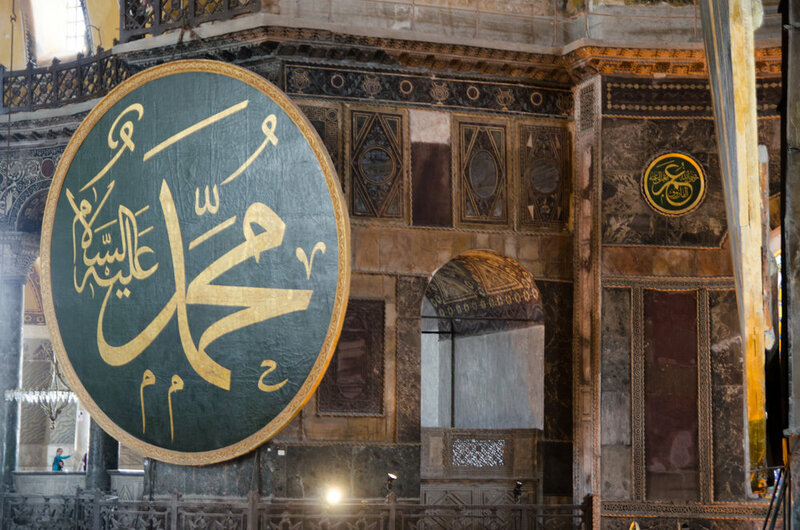 Then it became a mosque until 1931. Then secularized and renovated, it opened as a museum in 1935. Got all that? Good. There will be a quiz later. It’s ginormous. And with it’s history, it comes with a long (long) line. We got some snacks (an ear of corn and a kebab) and stood outside in the sun for about forty minutes waiting to get inside. Naive to what I was stepping foot in, I spent some time photographing the entryway, the ceiling producing a beautiful, yet fading fresco could not be ignored. And then, once inside the next room, I was overwhelmed. 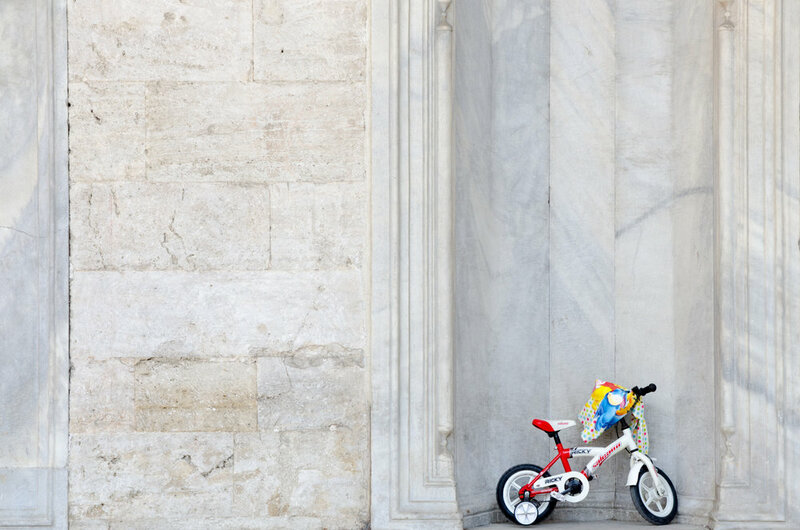 Not immediately by the building – the church? the mosque? calling it a museum doesn’t feel right. I was overwhelmed by the chandeliers and the crazy amount of people inside. 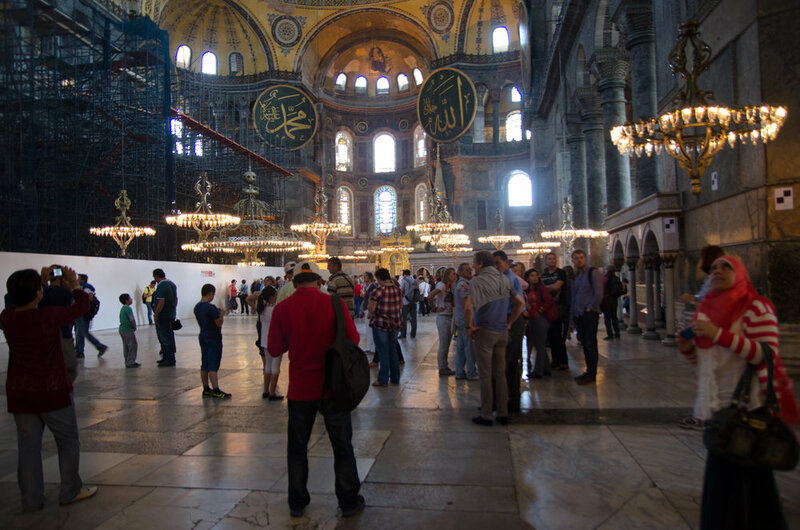 Don’t get me wrong, the Hagia Sophia, the Ayasofya (whatever you want to call it) is amazing. It’s big. It’s breathtaking. It’s astounding to feel like you’re in a church and a mosque at the same time. Something that I can say that I’ve never felt before- it’s always one or the other. But the people! They were everywhere. They were standing in front of your picture. Bumping into you from behind while you were trying to take a picture. Asking you to move so THEY could take a picture. It was overwhelming to both of us. And more so to Andrew, who hasn’t witnessed the throngs of tourists in Europe until now. I couldn’t decide which one was my favorite. So I just put all of them in. 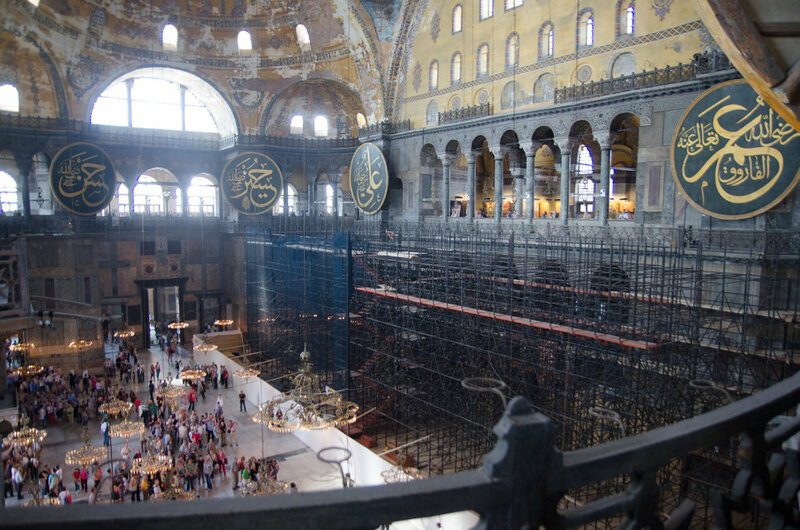 Half of the church/mosque/museum was being renovated. I tried to photograph around it as much as possible, but here’s what it looked like, to give you a better idea. We headed upstairs, which wasn’t exactly via stairs as it was a ramp, made of stone, all the way up to the second level. I wondered if it was constructed that way so horses could haul stone up to the second level instead of people carrying it on their backs. I can’t remember where, but this was done in another ancient site we were in. A fort or palace in India, perhaps? 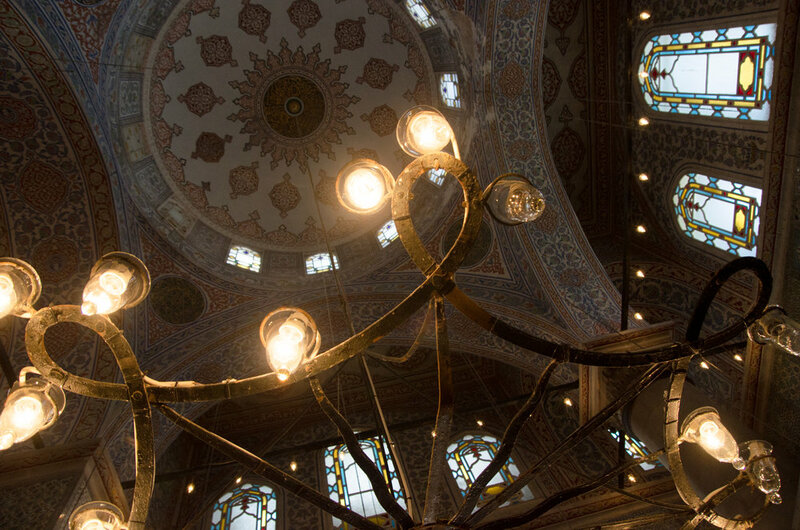 I was really drawn to the details of the ceilings and arches and of course, the chandeliers. 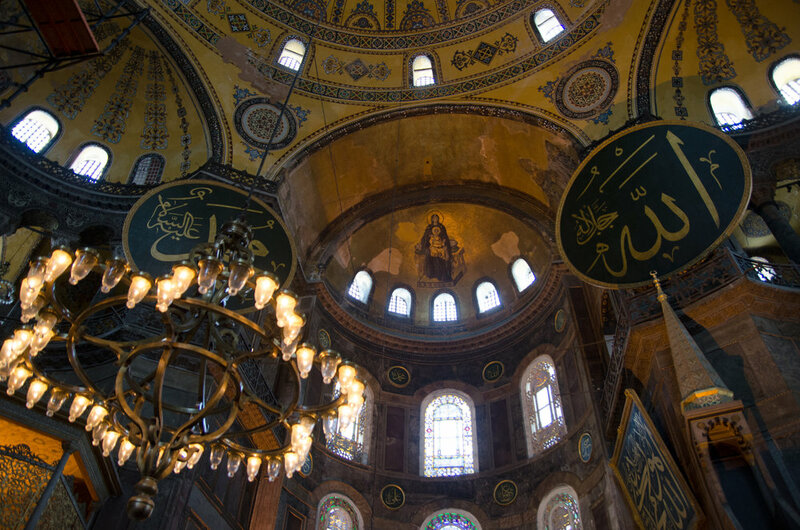 Many of the Christian mosaics were pastered over when it was a mosque. 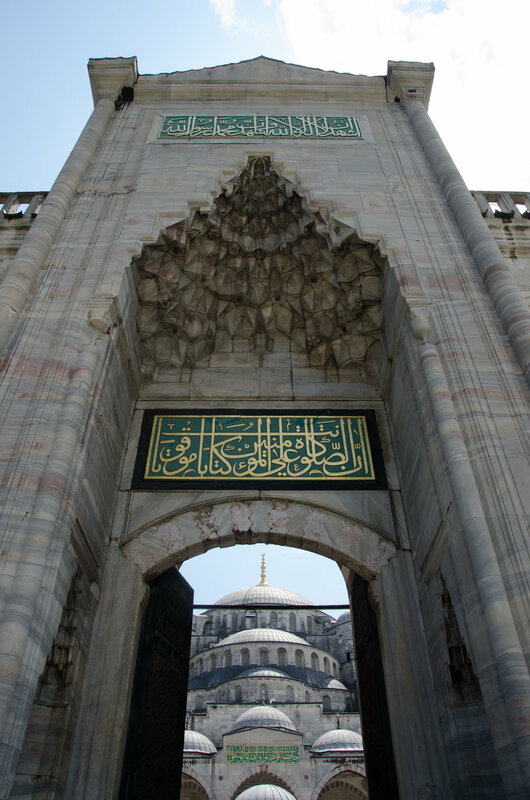 Eventually we made our way out of Ayasofya and back towards the Blue Mosque. This time it was open. 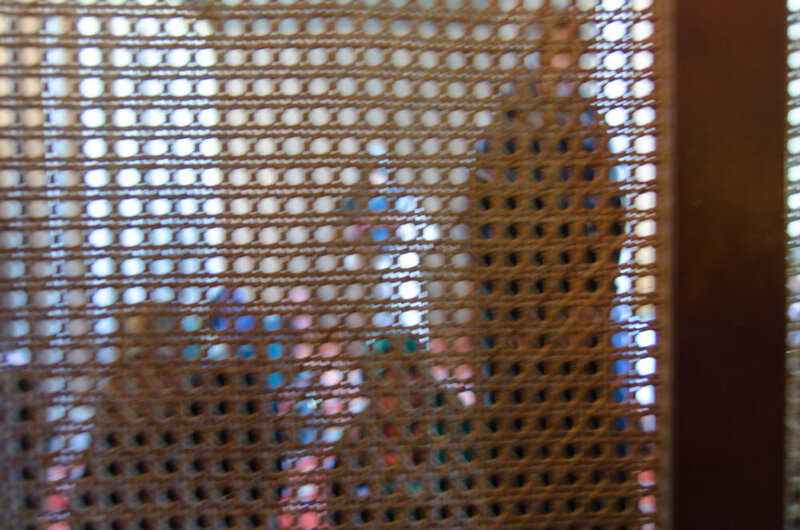 Andrew hung around outside of the mosque while I wrapped my new scarf around my head and stood in line to get inside. Strollers and this little bike sat outside of the entrance while their owners were inside. 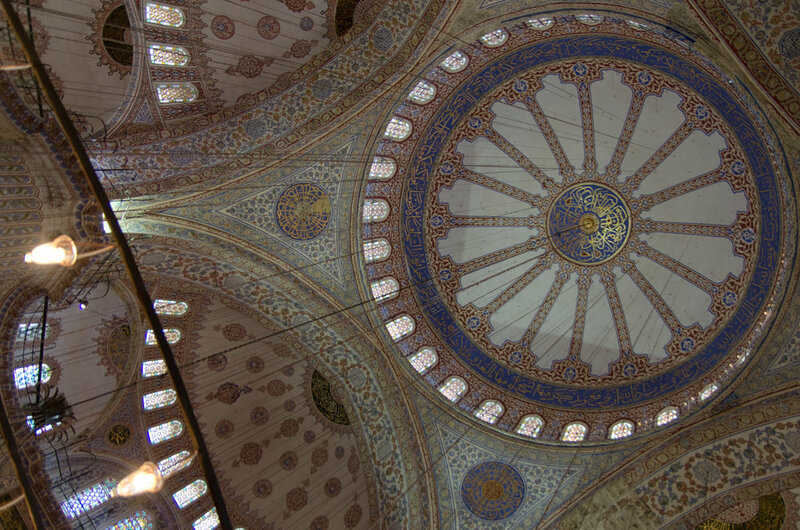 The Blue Mosque, is historically known as The Sultan Ahmed Mosque. It’s nickname stems from the blue tiles on the walls and ceiling inside. I tried my hardest to concentrate on looking up and not letting the throngs of tourists take away the beauty of the interior. I have to admit I rolled my eyes a bit watching the Muslim men walk through the tourists to where they could pray, I mean, take pictures. Their chests puffed out, while everyone else held their cameras above their heads to get a picture they were satisfied with made me wonder where all of the women were. In Istiqlal Mosque in Jakarta, the women were allowed on the main floor, but off to the side. I couldn’t see any women here anywhere on the main floor. 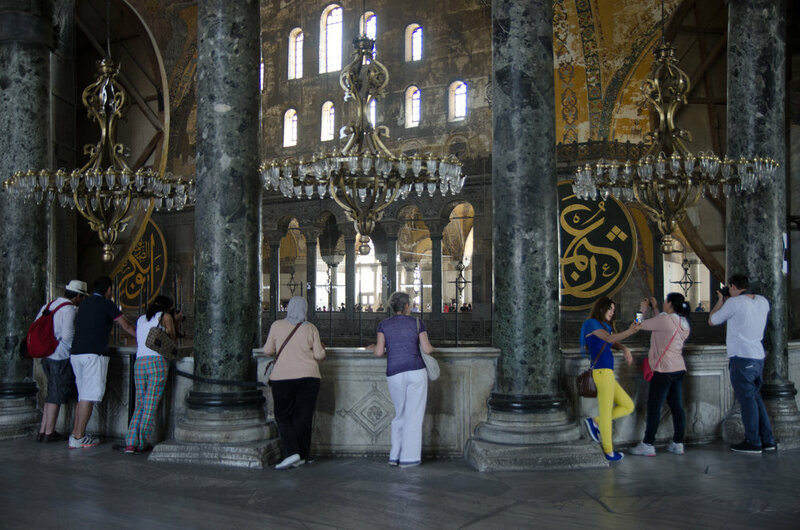 And then, as I was leaving, I saw the women praying on the outskirts of the mosque’s interior. Some areas partitioned off. I sighed, wondering if I will ever understand the role of women within Islam, and if the same role within Christianity is any better.